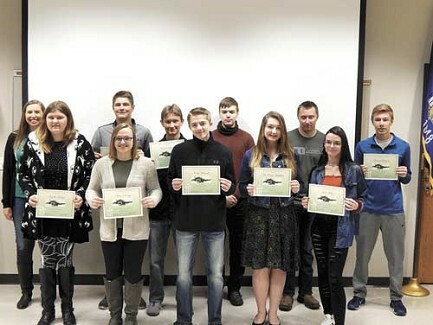 Rhinelander High School recently announced its March Students and Staff of the Month. Front row, left to right: Isebelle Twohig, Fine Arts; Alexis Denny, Business & Marketing; Cole Worrall, Math; MaKenzie Kuckkan, Physical Education and Jade Wilke, Family & Consumer Science. Back row left to right: Ms. Jensen, Staff of the Month; Jackson Zettler, Math; Colton Leman, English; Jackson Rich, Science; Justice Ring, Tech. Ed and Quinton Lamers, Science.